In most film/TV sci-fi, aliens are often stand-ins for humans with one trait or culture amplified. If we were to actually encounter aliens, it's extremely unlikely they're going to be bipedal humanoids that more or less think like us, where communication and interaction is relatively easy. But this view of aliens dominates aliens in our popular media, both because it makes portraying them more practical (just a human in some prosthetics) and because it makes storytelling easier. Instead, it's likely that they've been subjected to a totally different environment, with a different evolutionary path. They may look entirely differently from us, perceive reality differently from us, and think differently from us, in a way that we may not even have imagined. Attempts to describe legitimately alien aliens are much more common in sci fi novels than in film/tv, so I decided not to include them here. Instead, I'm interested in finding examples of alien aliens in film/tv. Spoilers will be open since it's a lot easier, but I would like to try to have one rule: state the name of the film/show up front before you describe it, that way if anyone is planning on seeing that movie, they can avoid that section. Here goes are a few off the top of my head. The entity seems to learn by using some sort of indistinguishable-from-magic force that changes and combines all living things near it. Not only are animal and plant life hybridized and altered in bizarre ways, but traits that aren't simple biology are mixed up too. A tattoo moves around several people. Her husband picks up and speaks with the accent of one of his team members. It's never clear what the entity's purpose is, or if it even has a purpose. It's unclear if it's malicious or even aware of what it's doing. This movie is essentially told from the perspective of an alien alien. We observe it being created, or born, or changed to pass for human. The opening sequence sees it biologically developing and doing vocal exercises to seemingly calibrate itself to use its vocal cords. It's unclear if it's a normal alien (normal for their race) that is essentially wearing a human suit to help its infiltration, or if it was a purpose-created fake human that awoke with innate programming to serve its purpose. We're never told what their goal is, just that they see that they target people who probably won't be noticed too much if they're gone for the apparent purpose of harvesting them in some way. We never see them communicate (or rather, the scenes that feature communication are very alien), it's never narrated what they're doing, and you can only infer their motivations or goals. I know it's based on a novel, and the novel goes into a lot more detail, but from what I gather it's very loosely adapted from the novel and more or less stands on its own. The explanation in the novel seems a bit on the mundane side, so I prefer the mystery of the film. 2001 Space Odyssey, Solaris*, possibly Stalker**. Solaris: If I remember right, it's about the crew of a ship approaching a planet and something that resides there being aware of and messing with them. Stalker: A zone that was visited by extraterrestrials gets all weird as a result. Sunshine too with that third act but let's not think about that further. Aliens often symbolically represent something; They're a plausible version of the ancient gods and spirits of mythology. Are there differences between the humanoid aliens and the non-humanoid aliens in terms of what they tend to symbolize? Last edited by MichaelEmouse; 03-17-2019 at 09:35 AM. I like (and would like to see more of) the Benzians on The Orville. The Whisperer in Darkness -- H.P. Lovecraft's crab-like Fungi from Yuggoth are t least mentioned in several LOvecraft works, but they're center stage in the 2011 film adaptation done by the Lovecraft Historical Society. Instead of puppets, they're respresented by stop-motion animated creatures, ecept for a few full-size porops. The War of the Worlds -- George Pal didn't give us G.G. Wells' slug-like octopoid tentacle Martians, but at least we got extremely non-human things with tri-lobed eyes. The Puppet Masters -- The 1994 adaptation of Heinlein's novel is alternately great and terrible, but their depiction of the invading "Puppet Masters", while not fitting Heinlein's description, are convincingly real. And done without any CGI. Invasion of the Body Snatchers -- having mentioned Puppet Masters, I have to bring in the Body Snatchers, in their many film incarnations. I think of them as humanoid, since they really are played by people, and the original plant forms are only there are a sort of source of "infection". You could say the same about several Zombie films, too. But then, you could argue that Puppet Masters do the same thing. But at least they had a separate, non-human existence, which they could revert to at will. Am I remembering the original "The Thing" correctly in that it was a plant like pod like thing? On review, nope, I'm thinking of some other 1950s black and white movie. Last edited by guestchaz; 03-17-2019 at 11:54 AM. 1. A creature that absorbs the bodies and incorporates elements of whatever living beings it touches--men, cactuses. It ends up as a prickly octopus, spider thing retaining some humanity from the unfortunate astronauts who first encountered it. 2. Little methane-breathers who land on Earth in football-sized pods, take over people's minds so they can build factories to create a hospitable environment to grow into larger beings (which look kind of like floppy carpets when glimpsed through the methane mists), and subject non-possessed, human factory workers to light jazz during the night shift. Last edited by Miss Mapp; 03-17-2019 at 12:12 PM. Are you thinking of The Triffids? No, the one scene that I remember is of the scientist walking down a narrow hallway, then into a lab with a bunch of the plants growing in starter trays. They had these roughly bell pepper sized pods that pulsated, then the scene switches to someone being chased down the hall by a mature version of the plant pod. It was released in the 50s, in black and white not color. Last edited by Miller; 03-17-2019 at 01:00 PM. 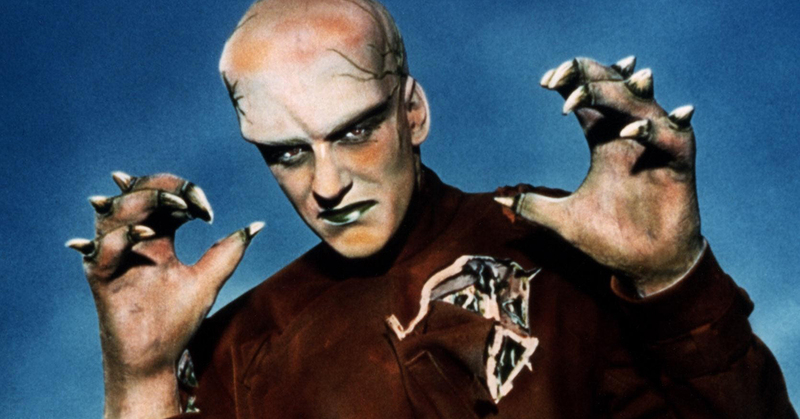 In The Thing from Another World (1951) the alien was humanoid-shaped. Analysis of its cells showed that it was an advanced form of plant life. It tried to grow seedlings to reproduce itself using blood from its victims, and one of the scientists also grew some seedlings using blood plasma. I don't think it counts as a truly alien alien, since as an adult it was a bipedal humanoid and any alien aspects of its mentality weren't shown. The British have a thing about grotesque aliens. All the beasties in the 1950s "Quatermass" episodes are pretty non-human. 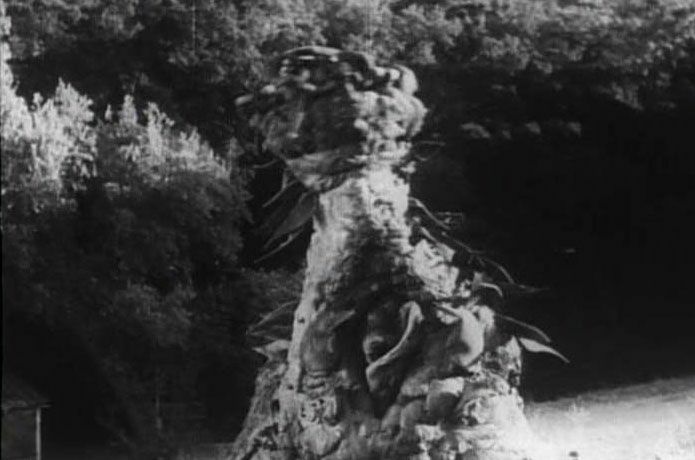 It's not clear what the alien things in The Quatermass Xperiment/ The Creeping Unknown look like originally, but after interacting with and absorbing human, cactus, and random other life forms, it looks like a real mess. 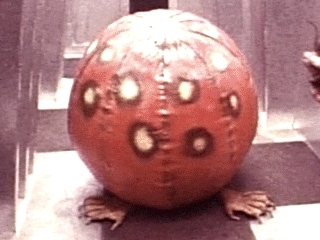 The Puppet Master-like things in Quatermass II/ Enemy from Space originally look like sort of black starfish, but at the end, the amalgamated THing in the Dome looks like a sort of blobby mess. At least the Nartians in Quatermass and the Pit/ Five Million Years to Earth don't look like blobs -- they're definitely insect-like. Another TV serial-turned-movie, The Trollenberg Teror / The Crawling Eye look like one-eyed really cold octopedes. One of my objections to most of these is that, for extremely non-human-looking aliens, it's kinda hard to them manipulating and controlling even simple technology, let alone a space ship. What the hell kind of civilization did The Thing have, for instance? Did the Quatermass things in Quatermass II only live through host bodies? Big insects, of course, ought to have serious problems withy the square-cube law, but they're easy to imagine, so they keep getting done. What the hell kind of civilization did The Thing have, for instance? Who says it has a civilization? I feel like gross monsters are only barely addressing the OP. If humans are a 0/10 on the alien scale, and rummer-masked humanoids on Star Trek are a 1/10, then giant insects or whatever are still only a 2-3. One question I think about regarding aliens is: where does it live? I don't mean the physical location in space--I mean questions like is physical location even a meaningful concept here? In movies like Annihilation and Solaris, it's not obvious that the aliens have any perception of the physical world that matches our own. They can affect it, surely, but it seems that these are side effects to some inscrutable behavior of their own. Humans live in a very small slice of the universe: we exist only at the 1-meter scale, even though there are interesting things at dozens of orders of magnitude (up or down); we perceive a thin sliver of the electromagnetic spectrum (and almost nothing else, like neutrinos or gravitational waves); a short range of timescales; 3+1 dimensions; etc. And even that hardly covers the possible range of aliens, because it assumes we're all living in the same physical universe. But take Solaris for instance--a sorta sentient ocean that can communicate with other sentient beings. Maybe it's a self-contained universe; a computational substrate that runs a universe of its own, with completely different rules. The minds living in it can occasionally perceive subtle outside influences, but these things are as alien to them as they are to us. The Thing isn't a bad example, despite it taking over recognizable hosts. Its universe seems to be one of biology, as it can move from host to host with no real effort. It probably has no recognition of the damage it causes, because as far as it's concerned it's just walking around the landscape. It would be like if we were told that subtle interactions between vortices in the air were actually intelligent beings, and that simply breathing killed or wounded them. There's nothing we could do about it. Last edited by furryman; 03-17-2019 at 05:40 PM. Well done whoever mentioned Catspaw. I want to sing the praises of The Man Trap again. I dont know how much was a choice of the director or writer...but aside from even the true appearance of the Salt Monster....its played more domesticated animal/companion then it is "sentient trickster". If we take everything at face value that is. "Why didn't it just ask for salt? Why didn't didn't it just go to the kitchen?" Despite what most people think there were at least two non-humanoid aliens in Star Trek TNG. The first was the giant snowflake alien from the first episode. I'm not sure if they ever even showed the second since it interacted with the crew via dreams. Theres that thing that was going to kill half the crew in the second season. Appeared with kind of a fuzzy face. Theres the "Conspiracy" claymation insects. That was another well-done episode if we take everything at face value. The aliens are undone by their own alienness. They were about to let Picard walk right out of the maggot-brunch! Out walks Picard, Picard beams up, Picard beams down with security a couple of minutes later...theyd probably still be eating. I remember the Martians from Stranger in a Strange land being non-humanoid too although this is a book. I think we may have more luck looking at books than visual media because visual media often has to keep it simple, doesn't have much time and has to actually show in some way what it's talking about. A book can get a lot deeper and take its time to establish characters, settings and the rules. Perhaps as importantly, it doesn't require a special effects budget. That makes me think: Atoms form together to create the next higher-order emergent phenomenon that is molecules. Molecules do the same with cells. Cells are alive but not aware. When they form together to create the next higher-order emergent phenomenon, they can create animals which are aware even if the cells that compose them are not aware. We're aware. When self-aware consciousnesses form together, can they create a higher-order emergent phenomenon? What might it be? Could we perceive or conceive it anymore than the neurons in our brains or the bacteria in our guts can perceive or conceive us? The Thing isn't a bad example, despite it taking over recognizable hosts. Its universe seems to be one of biology, as it can move from host to host with no real effort. It probably has no recognition of the damage it causes, because as far as it's concerned it's just walking around the landscape. Last edited by MichaelEmouse; 03-17-2019 at 06:22 PM. When self-aware consciousnesses form together, can they create a higher-order emergent phenomenon? What might it be? Could we perceive or conceive it anymore than the neurons in our brains or the bacteria in our guts can perceive or conceive us? Arguably, the internet is already an example of this. And of course we witness some of effect in hive animals--a hive of bees displays more complex behavior than any single bee. But yeah, we can imagine a group of human-scale intelligent beings that communicate more closely than we are capable of and form a real superintelligence. It's hard to guess what that would look like. The best analogue for The Thing is probably a virus. Well, it's maybe our best approximation from a human perspective. And you may be right that the contagion aspects come from the AIDS scare and the like. But whatever it is, it's more intelligent than a virus (which is only a step or two beyond a self-replicating molecule)--just not in a way that we recognize. We don't have the slightest clue what sort of universe it inhabits. I think we may have more luck looking at books than visual media because visual media often has to keep it simple, doesn't have much time and has to actually show in some way what it's talking about. Attempts to describe legitimately alien aliens are much more common in sci fi novels than in film/tv, so I decided not to include them here. Last edited by Darren Garrison; 03-17-2019 at 06:39 PM. It's flying a spaceship at the beginning. Unless it took over a different alien species as a host, it needs a civilization to build a starship. It's possible that it DID take over another alien race, but see below. Campbell, in his original story "Who Goes There?" strongly hints that the Thing's people were the ones responsible for the ship. As for "What makes you think it has a civilization?" even if it starts out as a brainless, mindless chimaera or cancer of a living organism, it's pretty evident that when it takes over a host, it acquires its knowledge. A bunch of these Things living together have to deal with each other or else there's anarchy. That's a Civilization. The Thing that appeared in both Campbell's story and the Carpenter movie could build a Starship from raw materials -- it's shown doing that. It didn't get that information from any of the guys it absorbed at the base. It was carrying that information from its previous existence. It's a thinking creature that can use tools and manipulate its environment at a high level. You get a bunch of those together, you've got a Civilization. Oh, but you say, it's really just one creature. No, it's not. It takes over multiple bodies. Unless it's telepathic (nothing indicates that it is)*, each of those is a unique individual. Remember what Macready points out -- each piece of that Thing is a distinct being that will try to save itself. Once you've got several trillion Things infesting the Earth (I assume it takes over animals as well as humans) they have to deal with each other somehow. When they fully take over, food's gonna be scarce. Civilization is how groups deal with limitations like that. "This is for real -- What if it can Read our Minds?" Last edited by CalMeacham; 03-17-2019 at 06:39 PM. 1. The space jellyfish from the pilot "Encounter at Farpoint"
2. Armus--The Skin of Evil that killed Tasha Yar from "Skin of Evil"
3. The Crystalline Entity from "Silicon Avatar". 4. The Microbrain that lived in the soil of Velara III in "Home Soil"
5. Nagilum from "Where Silence Has Lease"
6. The baby space-borne lifeform that attached itslef to the Enterprise in "Galaxy's Child"
7. The coalescent organism that mimicked others in "Aquiel"--the episode was basically a ripoff of the 1980 movie "The Thing"
I haven't read the short story, but even assuming this is the case, it doesn't mean the alien developed the underlying technology, just that it remembered enough from previous hosts to build a new ship. Maybe telepathy is common in the universe. Or at least higher-bandwidth inter-mind communications: humans are rather limited in this respect, and can only transmit a few bits per second to each other. A high-bandwidth acoustic or optical link might be enough to sustain a distributed consciousness, and that ends up being the case for most hosts. The alien is pretty good with reconstructing a creature's biology, but it has limits. And the more limited the biology, the harder a time it must have in improving things. Remember what Macready points out -- each piece of that Thing is a distinct being that will try to save itself. Right, the Internet kinda is humanity's brain. A lot of situations where game theory gives us predictions which are both accurate and counter-intuitive might count as a super-organism. Human organizations like countries might also be similar. Well, it's maybe our best approximation from a human perspective. And you may be right that the contagion aspects come from the AIDS scare and the like. But whatever it is, it's more intelligent than a virus (which is only a step or two beyond a self-replicating molecule)--just not in a way that we recognize. We don't have the slightest clue what sort of universe it inhabits. .
You're right, it's more than a virus. Aliens are hard, obviously. We can barely understand other mammals, despite sharing most of our biology. Who knows how a bat experiences echolocation, or how a platypus experiences electroreception? They have a complex sense that's totally unavailable to us. Their motivations are reasonably easy to understand, but they have an inner life that's utterly mysterious. The Abyss (1989) – unnamed alien(s) not shown in original form, iirc. Last edited by Dropo; 03-17-2019 at 07:38 PM. Was that a reference to Thomas Nagel? Not directly, though it's likely that I got the idea from some philosophical reading or other, which may have itself been influenced by Nagel. Anyway, thanks for the link. I did choose bats for the same reason that Nagel did: being a mammal, you can't just write it off as having no internal experience as you might an insect. In most respects, it obviously experiences most of the same things as humans: hunger, pain, comfort, etc. It just happens to also have this sense of sonar which is utterly inconceivable to us. We can try to make some analogy to sight, or hearing, or touch, but all of these will fail since it's not quite any of those (even if it shares some characteristics with all of them). One thing that's really fascinated me is computer vision and "thought" if we can call it that. That might be more alien than any extraterrestrial. In the movie Upgrade, the protagonist gets implanted with a chip that works as a kind of second mind. There are fight scenes in which he's having difficulty and has to resort to asking the chip to take full control of his body so that it can beat his opponent. The chip does so and kills the opponent in very gruesome, unexpected ways. He's completely freaked out by what the chip does to win the fight but it does win the fight so he keeps using it. I think we've all had moments when we asked a computer to do something and were surprised by how the computer interpreted our command. With neuron networks, it may become too difficult for humans to understand exactly what's happening during the computer's thought process and yet neural AI will be very powerful so we'll use them anyway. We can expect that, once in a while, it'll give us a inappropriate output (including behavior) for reasons which our brains can't understand because it's just too complex for us to make sense of it. Which brings us back to HAL 9000 in 2001 and whatever the aliens/monolith/starchildren were in that movie. We're still arguing about what those were. Last edited by MichaelEmouse; 03-17-2019 at 08:48 PM. How about the Organians (Star Trek [TOS]: Errand of Mercy)? Pure energy beings. So we have a creature that's more alien than almost anything on Star Trek (with exceptions), and yet is closer to us than almost anything else on Earth, let alone the cosmos. That should recalibrate our scale of alienness. I don't think sonar is so ineffable. It is sound, and an average human can get a lot of position information with their ears. But our vision is so dominant that our stereo-aural ability is underappreciated. The TARDIS - based on what we've learned over the past 56 years of the show, they grown as much as built, and they clearly possess sentience, which meet my criteria for lifeform. The Nestene Consciousness, although it does use humanoid creations called Autons when it finds them useful. The Rutans - these are the ones the Sontarans are always at war with. We don't seen the as often as the Sontarans. Whatever the hell that thing was in the episode "Midnight", although we didn't actually see it so maybe it doesn't count. The Atraxi from "The Eleventh Hour". The Vashta Nerada from "The Silence in the Library"/"Forest of the Dead" which... are sort of like carnivorous shadows. It's hard to say--perhaps utterly inconceivable is exaggerating slightly, since we can do a few sonar-like things, like detect some degree of texture (metal vs. wood vs. no walls, etc.). But it's so crude that I have to think there is a kind of step change--a creature with a single light/dark sensor probably doesn't have vision in the sense that we do. At any rate, sonar is pretty middle of the road anyway. We can understand it, if not actually experience it at a deep level. But alien aliens may have senses that no Earth life shares, including things that barely have contact with our physical world at all. That's pretty good. I'll have to watch the other series when I have some time. So far, I think Annihilation, Solaris, Stalker, and The Thing are the best examples of actually alien aliens. The rest are too physical and have too obvious motives. Though I agree with the OP that Arrival earns a runner up. "Aliens" being in fact poorly disguised humans has always been one of my pet peeves in science-fiction. There's no better way to ruin a movie for me than to show aliens that are basically humans with big eyes or weirdish noses. Solaris is an oustanding example of what you're looking for, indeed. I haven't seen any of the movies but the novel on which they're based may be my favourite science-fiction book. The whole concept is precisely the absolute alienness of the "creature" and the definitive, essential impossibility for us to establish any kind meaningful communication with it. Are the colossal structures that rise occasionally from that sentient ocean an attempt at establishing contact ? Are the creepy hallucinations experienced by the crew proof of evil intent or innocent efforts thwarted by our utter incompatibility ? It's impossible to tell. Last edited by Les Espaces Du Sommeil; 03-18-2019 at 04:42 AM. Truly non-human aliens don't think like humans; they're not just odd bodies with human goals and emotions. The best examples from literature show up in Weinbaum's A Martian Odyssey, which was one of the first to show aliens as alien and still one of the best examples. 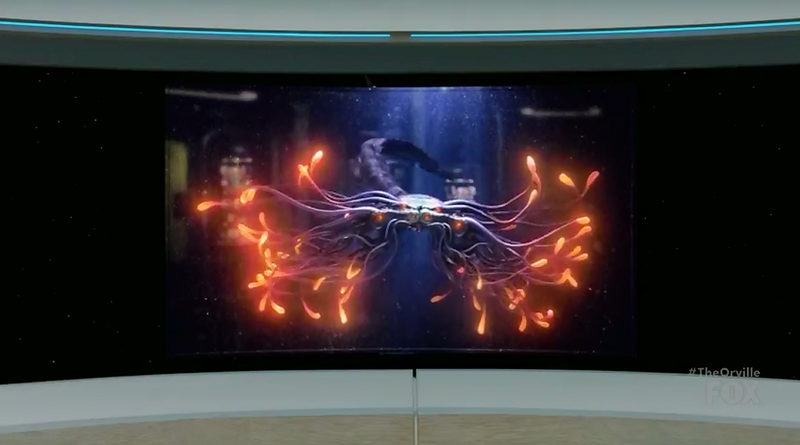 They can manipulate water, but I recall them looking like manta rays with lights. Ed Harris sees them when they take him to their city. The Thing[/I] (1982) I don't think the alien's true form was ever seen, since as in the original story Who Goes There? it was a shape shifter. That one counts as an alien alien. 2. Blorgulax--the shapeshifting alien in "Murder on the Planet Express"---which is a parody of the 1980 movie "The Thing"
3.The energy being Mellivar who was big Star Trek fan. 4. Yivo--the title monster in "Beast with Billion Backs"
5. the ball creatures from "War Is the H-Word"
6. the water creatures from "My Three Suns"
Last edited by dorvann; 03-18-2019 at 11:26 AM. Except, when we see the original Dalek Dave Ross Davros, he is a wrinkly humanoid.